1. Convert the decimal number 231 into its binary equivalent. Select the correct answer from the list below. 2. In an 8 bit binary number, what is the total number of combinations of the eight bits? 3. How many usable hosts are available given a Class C IP address with the default subnet mask? 4. Which statement describes NAT overload or PAT? • Each internal address is dynamically translated to an individual external IP address. • A single internal address is always translated to the same unique external IP address. • Many internal addresses can be translated to a single IP address using different port assignments. • Many internal addresses are statically assigned a single IP address and port to use for communications. 5. Which IPv4 class of addresses provides the most networks? 6. Which statement accurately describes public IP addresses? • Public addresses cannot be used within a private network. • Public IP addresses must be unique across the entire Internet. • Public addresses can be duplicated only within a local network. • Public IP addresses are only required to be unique within the local network. • Network administrators are free to select any public addresses to use for network devices that access the Internet. • It is possible to determine which class an address belongs to by reading the first bit. • The number of bits used to identify the hosts is fixed by the class of the network. • Only Class A addresses can be represented by high-order bits 100. • Up to 24 bits can make up the host portion of a Class C address. • Up to 24 bits can be used to identify unique networks. • Three of the five classes of addresses are reserved for multicasts and experimental use. 8. Company XYZ uses a network address of 192.168.4.0. It uses the mask of 255.255.255.224 to create subnets. What is the maximum number of usable hosts in each subnet? 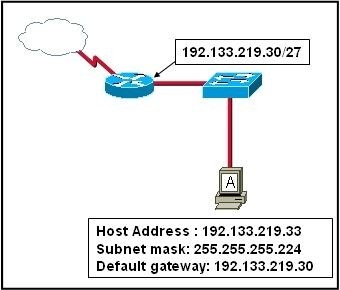 9. hat is the network broadcast address for a Class C address of 192.168.32.0 with the default subnet mask? 11. IPv6 increases the IP address size from 32 bits to how many bits? 12. What is the range of the first octet in a Class B address? 13. Which IPv4 class provides the highest number of host addresses per network? refer to the exhibit. Which range of IP addresses would allow hosts that are connected to the Router1 Fa0/0 interface to access outside networks? 15. Which option shows the proper notation for an IPv6 address? 17. What must happen for a privately addressed host on an inside local network to be able to communicate with an outside destination host on the Internet? • The host IP address must be translated to an outside private address. • The host IP address must be translated to an inside local address. • The host IP address must be translated to an outside local address. • The host IP address must be translated to an inside global address. 18. Which port numbers are used by PAT to create unique global addresses? 19. Static NAT works by mapping a specific inside local IP address to what other specific address type?